We know cataracts can have a negative impact on your overall eyesight. The symptoms and treatment for cataracts can be complicated, that's why you should come to our Reading Cataract specialists. With years of experience serving the Reading and Sinking Spring residents, we give you the technology and expertise you need. If you want to get back the vision that you once had, schedule an appointment with our team today! 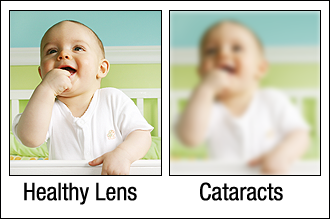 A cataract is the opacification of the eyes natural crystalline lens. The actual lens of the eye becomes cloudy and hardens over time. Many people describe developing cataracts as the blurring of vision with the effect of looking through a foggy window. This cloudy lens distorts and blocks the passage of light through the eye to the retina. Eventually, a mature cataract will require removal and replacement of the natural lens with a bio-compatible produced intraocular lens. It has been stated by numerous ophthalmologists that if you live long enough you will eventually develop cataracts, but there are some items that might cause or accelerate the process of developing cataracts. Cataracts are caused by old age, eye injuries, or even some eye diseases. Cataracts can affect people of any age, however; they are most common in senior adults. In the event that you have developing cataracts, you can rest assured that the doctors of our practice utilize the most advanced surgical techniques combined with the latest in intraocular lens technology to make your visual experience after cataract surgery a pleasant one. The removal of cataracts used to be a very difficult and unsuccessful process. Since the late 1960's the technology available to ophthalmologists has been nothing short of amazing. Patients undergoing cataract surgery today have nothing to fear, as the options for vision correction are truly remarkable. Cataract surgery is an out-patient procedure that usually takes no longer than 20 minutes. Once our doctors have diagnosed a cataract affecting your vision, the only way to treat the impairment is to use cataract surgery to remove the cloudy lens and insert a new intraocular lens. Cataract surgery is performed using a surgical technique popularized by Charles Kellman in the late 1960s. This technique involves a no-stitch no needle approach that leads to a relatively fast visual recovery. During the surgical procedure the patient is first prepped using a local anesthetic and drops. After the eye has been sterilized the surgeon will make a 2.5 to 3 millimeter incision in the eye. In order to see inside the eye our doctors perform this delicate surgery with a powerful magnifying microscope. A device known as the emulsifier is inserted and begins to ultrasonically crush the cataract. Once the cataract has been pulverized it is then suctioned out via a small tube. Once all of the old lens material has been evacuated a foldable intraocular lens is inserted in the same place as the old lens. Thanks to the years of research and dedication of many ophthalmology pioneers we have arrived at a NEW day where having a cataract is not the end of the world. In fact patients now have vision correction options that can restore vision without complete dependence on glasses. This advanced technology is having an amazing impact on the lifestyle of cataract patients restoring youth in the ability to see while driving, reading or even driving golf balls. Cataract Patients now have the option of not being dependent on their glasses to read a menu at a restaurant or read the newspaper. A new era in intraocular lens technology has arrived and is now known as multifocal IOL implants.